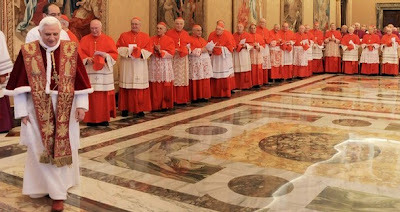 Whispers in the Loggia: Vatican: Pope's Designer "Not Prada, But Christ"
"The priest does not choose such ornaments because of an aesthetic vice -- he does it to put on the new clothes of Christ," said an article in the June 26 edition of L'Osservatore Romano. Liturgical vestments represent "dressing oneself anew in Christ" in which the priest "transcends his identity to become someone else," to become one with Christ through a process of interior transformation and inner renewal, it said. "The pope, in short, does not wear Prada, but Christ," it said. The article was written by Spanish novelist Juan Manuel de Prada, who is not related to the Milanese Prada fashion company he mentions in the critique. It presents a harsh reproach against the way some media have "trivialized" Pope Benedict XVI's sartorial styles. 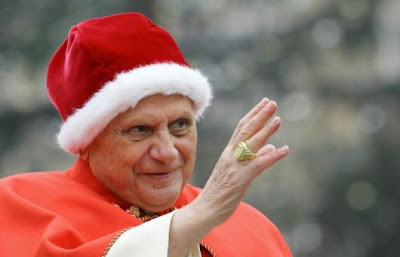 It said the pope has received an "unprecedented" media blitz over his decisions to bring back the "camauro" (above), a red velvet cap trimmed with ermine; a red velvet, ermine-trimmed cape, called a mozzetta; and a wide-brimmed red straw hat that Pope John XXIII often wore. 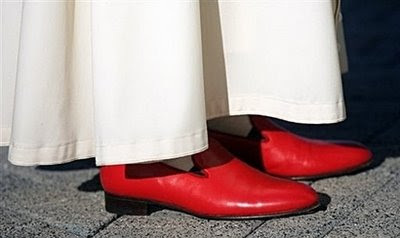 Also, "the hearsay" that the pope's red leather shoes [top] were Prada-designed footwear is "naturally false," it said. The article said seeing Esquire magazine honor the pope's style sense last August and naming him "accessorizer of the year" caused "a certain amused perplexity" and indicated "a frivolity much characterized by an age that tends to trivialize what it doesn't understand." The pope is a "simple and unpretentious man" as could be seen by the "modest black sweater" peeking out from under his new vestments as he greeted the faithful in St. Peter's Square moments after his 2005 election, it said. However, the media frenzy over the pope's choice of attire paradoxically has uncovered a grain of truth, it said. He is concerned deeply over how he is dressed but for completely different reasons. It said Pope Benedict wants to celebrate the liturgy in the most "essential way," as an "innermost demand, the search for an inner purity." Ornate elements and liturgical vestments do not represent frivolous "accessories," but rather represent this "essential" nature and the "anticipation of the new clothes of the resurrected body of Christ," it said. And with the new Petrine pallium still to make its formal debut, they ain't seen nothin' yet.